STATION F, the world’s largest startup campus opening in Paris in 2017, has just announced its first members and opened startup applications. A 34,000m2 campus for over 1,000 startups in Central Paris. The 34,000m2 campus is located in a historical monument, a former train station built in 1929 by famous French engineer Eugène Freyssinet. The space has been renovated by award-winning French architects Wilmotte & Associés and is designed for collaboration and innovation. 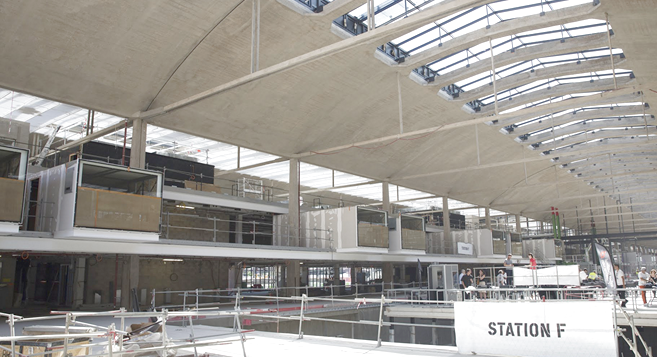 The STATION F campus features a startup zone with over 3,000 desks, private offices, meeting rooms, various event spaces including a 360-person auditorium, an on-site fablab, a post office, a pop-up shop, a café, a 4-kitchen restaurant and a bar open to the public 24-7. A housing extension is also being built for 600 entrepreneurs to live in nearby apartments starting 2018. – Facebook will have a presence at STATION F with details to be announced in the new year. – vente-privee will launch its first-ever startup program at STATION F.
– STATION F will be the new home to the incubator of top French business school HEC Paris. – Top VC funds including Daphni, Ventech and Kima Ventures will have their offices on-site. – The on-campus prototyping lab will be operated by US-based TechShop Ateliers Leroy Merlin. Startups interested in joining STATION F can apply to a variety of startup programs run by partners or they can apply to STATION F’s Founders Program. The Founders Program core philosophy revolves around one idea: 90% of entrepreneurs’ problems are solved by other entrepreneurs. Therefore, everything offered through the Founders Program is validated and recommended by other entrepreneurs. “There are no appointed mentors, no useless partners, no mandatory workshops: we believe in our entrepreneurs’ independence and ambition” says Roxanne Varza, Director of STATION F. Early stage startups can apply from December 5th to February 5th online at www.stationf.co. STATION F will open its doors in April 2017 and pricing is €195/desk/month. Is AI-powered social learning the future of edutech?